The artwork of Ellen Gunn is characterized by delicate and austere beauty, beauty she somehow manages to derive from the far less exquisitely restrained reality in which she and all the rest of us actually live. About her art Gunn says: An artist takes the everyday things that you behold and shows them in a more intense way. My work is representational, and yet there is nothing I do that you could not look out of a window and see. The shape of the land is there, but it is simply a starting point. Although my work is based on realism, it is not anchored in slavish detail. It is rather an illumination and a refinement of what I observe. Gunn was born in Rockville Center, New York, in 1951. From an early age both her father, William Neal Gunn, and her uncle, Howard Arnold, gave her extensive artistic training. 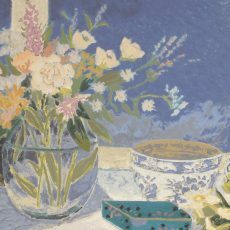 Both men were noted watercolorists, and her father was also proficient in oil painting and design. Until her fifteenth year, Ellen studied the piano as well, attending a school whose purpose was to train concert pianists; but when she realized that she would have to give up one pursuit in order to master the other, she chose to master art. Gunn continued her studies in art with Pat Steir and J. C. Suarez at the Parsons School of Design in New York City, where she graduated with honors in 1973. The year after, she studied at the School of Visual Arts also in New York. Looking for a change from New York, Gunn moved to California in 1976. In 1980 she studied etching and printmaking at the Kala Institute in Berkeley, and from 1981-82 she studied printmaking exclusively at the California College of Arts and Crafts in Oakland. Gunn's numerous corporate and public collections containing her works include the San Francisco Museum of Modern Art, the Alpha Pacific Corporation, the American Honda Motor Company, Briarmead Studios, Martin-Marietta, Northrop Aviation, Prudential Insurance, State Farm Insurance, and the Hilton Hotel Corporation. Her larger exhibitions include Artexpo New York, Artexpo Los Angeles, Triton Museum (San Jose, California), Sterling Vineyards (Calistoga, California), Chilmark Gallery (Martha's Vineyard, Massachusetts), TM Artworks (San Francisco), Designer Showcase (Palo Alto), the Incorporated Gallery (New York City), Sotheby's Auction House, Gallery de Tours (Carmel, California), and the Following Sea Gallery (Honolulu). 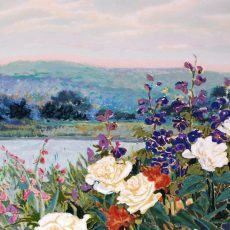 Gunn has worked in the past with oils, acrylics, watercolors, monoprints, and etchings, but today she uses primarily the medium of pastels to create landscapes and still lifes. She describes the intentions that animate her when she paints: I want to create art that is compelling. I seek to produce images that have a striking quality, that provoke a real emotion - where color, line, composition, and mood all come together into an image that really elevates the viewers' awareness and changes their outlook and perspective.